I may have returned the cars a few weeks ago but the questions are still coming in. The questions, mind you, generally revolve around the Kia. This is to be expected as Genesis as a brand remains relatively unknown. There’s also the fact that Kia’s made quite the splash with their bargain luxury performance grand touring car slayer. Truth be told, I’ve now driven the Stinger GT on two occasions and I’ve nowhere near had my fill of it yet. It’s sheer presence on the road, although there are essentially none on the roads, draws attention. The Genesis G70, on the other hand, not that there are any more of them on the road, would nearly always drive by unnoticed. What’s most impressive about these two cars is how different they are, despite relying on quite nearly the exact same ingredients. It’s like if the Colonel used the same 11 herbs and spices but came up with two very distinct flavours. Hats off to both Kia and Genesis for jobs equally well done. The cars, however, are not equal. Let’s get right into the thick of things and address the second largest differentiation, after the outer shells, between these two cars. The Kia Stinger GT’s driving characteristics are right there in its name. This Grand Touring automobile is built for spirited jaunts on the highway in comfort however it will not shy away from the occasional series of switchbacks on your favorite country road. It’s been designed as a road companion with a few talents. The Genesis G70’s got the BMW 3 Series square in its crosshairs. That’s the deal with the G70. This car may share suspension designs with the Stinger, but it is very happy when pushed hard. The chassis’ dynamics are setup to keep up with the best in the segment and it is, without a doubt, truly gifted. The Gen’s further tuning can make it just as compliant over ugly roads as the Stinger however the latter cannot maintain the same pace at higher rates of speeds through sinuous mountain roads, for example. Although this reads like a fault, I find the Kia’s pitch and roll endearing – it’s real driving. Both provide better than decent steering feel, for what their type of cars, with good precision. And excellent braking performance. Now, here’s where things more or less repeat themselves. Both cars can feature a twin-turbo 3.3-litre V6 that produces 365 horsepower at 6,000 rpm and 376 lb.-ft. of torque between 1,300 and 4,500 rpm. As well, an 8-speed automatic transmission and an AWD system are included. For the moment, only the G70 is available with a standard turbocharged 2.0-litre 4-cylinder engine that develops 252 horsepower at 6,200 rpm and 260 lb.-ft. of torque between 1,400-4,000 rpm. It can be mated to the 8-speed autobox or a 6-manual transmission. With the latter, the G70 is RWD. 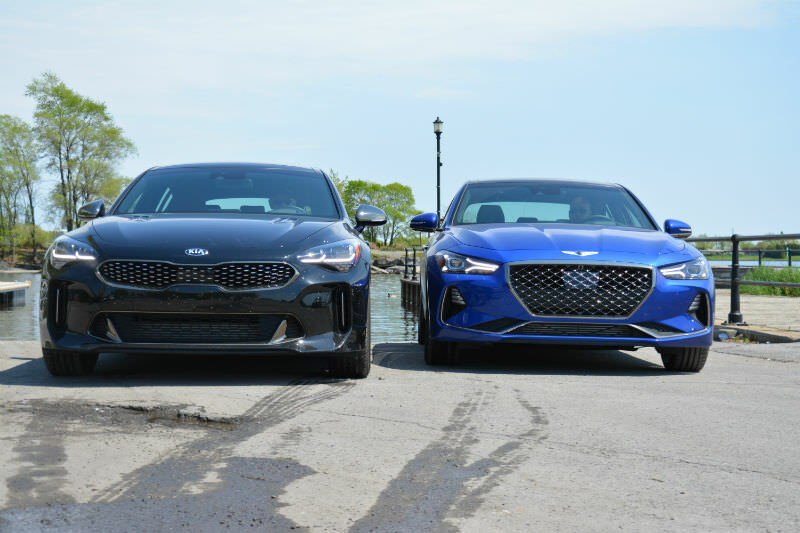 On paper, and in reality, the Genesis G70 and Kia Stinger GT are both quick cars. A launch control mode allows the G70 to hit 100 km/h in just over 5 seconds while the heavier Stinger requires an extra 3 or 4 tenths of a second to reach the same speed. There are no weaknesses in this drivetrain other than the occasional glitch in the transmission – more than once, and no matter how much pressure was applied to the throttle while in Sport drive mode, the transmission would take far too much time to do its thing. This seemed to occur more often in the Genesis.